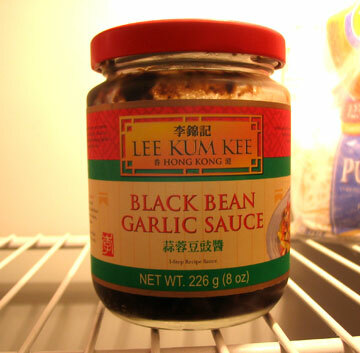 One thing I can't do without, and that you'll always find in my refrigerator, is a jar of black bean sauce. I use it a lot whenever I'm making Chinese-inspired dishes, especially stir fry. It gives your dishes a hearty, distinct flavor. And it's pretty salty, so just a tablespoon in whatever you're making will probably do the trick. You'll see me put this ingredient in a lot of recipes I'll be posting in the near future. Black bean is a staple in Chinese cooking. In the old days, people would buy dried black beans that are salted and then soak them overnight to soften. Then when they're ready to use it, they grind it up into a paste, sometimes with crushed garlic. But now, the sauce is made for you in a jar. And luckily you can pretty much find it at any grocery store. I usually buy mines from a grocery store in Chinatown because it's still cheaper, but in a pinch I can find it in my local Safeway in the Asian foods section. And it seems like this Lee Kum Kee brand has cornered the market on black bean garlic sauce. I see this brand everywhere, which is fine because it is one of the best makers of Chinese food products. Since the tiny restaurant Dopo opened more than two years ago, you could always guarantee a line outside as hungry East Bay diners waited to try the daily creations of two former chefs from Oliveto. Well, the lines are smaller these days, but not because of a decrease in the quality of food. Dopo is tiny no more. Closed for a few weeks in September, the once 30-seat restaurant reopened about a week ago doubling its size with more tables and an expanded bar area. And even with the bigger size, the restaurant is still able to fill their new tables with diners, including the outdoor tables along the side of the house-like location (or what I call, “the alley”). How this tiny trattoria with its brick oven can attract returning diners is because of the skilled execution of the chefs. The menu selection is limited because it changes daily, but that means you can always discover new favorites and get to taste what’s in season. And there’s always the daring use of ingredients such as rabbit, octopus, or pigeon. The dining experience will be different than what most Americans think about when they go out for a nice meal. Think European, which means controlled portions with minimal ingredients but loaded with taste. If you’re expecting a big plate of food, then you may need to stick with ordering Dopo’s thin-crust pizzas instead of the entrees. The pasta dishes will definitely satisfy you, but again, don’t expect a lot of ingredients. The chefs focus on simplicity so that you can appreciate the main ingredients featured in the dish. While most of the items on the menu are worth getting for taste and price, I wouldn’t recommend spending the big dollars for the salami platter. The mixed selection of fine Italian salami go for a minimum $25 for two people, and you get a plate of maybe 16 paper-thin slices of meat. Yes, they’re tasty, but you’re wallet will regret the hefty price for what amounts to a light snack. Minor point: The restaurant needs to find a good sommelier to develop its wine selection, which currently serves some mediocre reds. Did anyone taste these before putting them on the menu? Dopo has ambitious culinary dreams, and now they have the dining room to support it. Risotto is one of my favorite dishes, and I make several versions of this Italian staple. So I hope you like risotto because I'll be posting a number of risotto recipes. First up, a risotto for the summer tomato. People think the tomato is the ultimate summer ingredient, but really, the tomato can still be found even in these first few days of fall. And this year's crop is supposedly bigger and brighter, so hopefully we'll see this lucious red (is it a fruit or vegetable? ), plump, tasty treat for a few more weeks. People think risotto is hard because you have to get that right creamy consistency to have an enjoyable meal. But I think it's quick and easy. The actual cooking time is typically 15 minutes from beginning to end, and you get this luxurious meal that's a blank canvas for creativity. It's true you do have to watch the pot carefully to make sure the rice doesn't stick to the pan, and that you're regularly adding broth to feed your rice. Still, what's 15 minute of watching and stirring. It's all worth it when you impress your friends with this dish that people often order at a restaurant but never attempt at home. I say try it. You'll be hooked. Slice the tomatoes and lay them flat in a roasting pan lined with aluminum foil or a baking dish. Drizzle olive oil to coat the tomatoes. Add three or four twigs of fresh rosemary (ripped apart) and sprinkle some sea salt, then gently mix to make sure all the slices are coated. Place in oven and bake for 20-25 minutes until the tomato’s skin starts to wrinkle and you get a slight browning color on top. In a medium saucepan, warm 2 tablespoon of olive oil over medium high heat and add onion. Cook for about two minutes until translucent, making sure not to brown the onions. Add rice and stir with onions, letting the heat toast the rice for about a minute. Turn heat to medium and add wine and cook until most of it evaporates. Add broth, about 1 cup, with two twigs of rosemary. Continue cooking for about 15 minutes, adding 1 cup of broth along the way, until rice is al dente, or almost done. Add beans about five minutes before the risotto is done. Remove saucepan from the fire and stir in butter and cheese, taking out the rosemary twigs. Add salt to your taste. Let it sit for about a minute, then plate up your risotto. 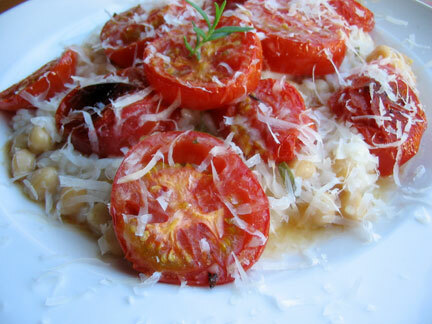 Get your roasted tomatoes from the oven and place slices over the rice. Garnish with more parmesan. Makes two servings. Serve with small green salad. Pair with a California chardonnay. TIPS: Warming your broth and setting it on the side to use while cooking your risotto will make sure your risotto has consistent heat throughout the cooking process. Be patient: Don’t feel tempted to add all the broth in at once. You’ll end up making soup because the rice won’t be able to slowly absorb the tasty broth. Also, you may not need to use all the broth or you may run out. If your risotto looks ready with a nice creamy texture, then don’t bother adding any more broth. If you run out of broth and it looks like your risotto still needs more time, add some water. You’ll make up for the taste with some salt for seasoning. CHOICES: Risotto rice makes this dish unique with its short grain and creamy texture. So you can’t substitute it with the typical long-grain rice or even Japanese sushi rice. But you do have choices. There are three main Italian rice to make risotto: Arborio, Carnaroli and Vialone Nano. Arborio is the one most widely available outside of Italy and can be easily found in any grocery store. It consistently cooks in 15 minutes and produces a nice cream. But don’t be afraid to experiment with Carnaroli and Vialone Nano if you spot them on a gourm et store shelf. They both cook a bit longer, but Carnaroli grains keep more of their shape so it’s a nice choice if you don’t like your risotto too mushy. Vialone Nano is creamier if you want to go the other direction. It’s your choice, Goldilocks. What has now become a regular gem in the family-friendly Rockridge neighborhood in Oakland is the restaurant A Cote. Since its opening next to the well-established Citron Restaurant and a couple blocks from the standard-bearer Oliveto, A Cote has been the king of small plates dining with a California twist in the neighborhood. One of the first to play on the growing trend of small plates, or tapas in Spain, A Cote does small plates well, offering a nice variety of dishes that celebrates the California seasons. The restaurant has a main front room with a bustling bar and rear patio seating with a wondrous garden that’s perfect on a summer evening. Its chefs know how to combine the seasonal ingredients in perfectly executed fashion. Fresh pears are perfectly ripe, firm but soft. Roasted figs are cooked to melt in your mouth and paired nicely with generous offerings of prosciutto. A Cote knows how to highlight the right blends of food, and its flat bread is particularly flavorful and great for kids. (Flat bread is a euphemism for fancy pizza, says our waiter. Gee, thanks for popping our bubble, dude.) But I didn’t find any new daring combinations that tickled my culinary curiosity. If this was an Iron Chef challenge, A Cote’s chef would lose points for creativity, playing it safe with typical pairings like pear salad with endive and goat cheese and duck leg with pomegranate (and a bit heavy on the lentils). Still, despite the expected, A Cote does what it knows well. It offers a variety of cheese that complement each dish and offers a lot more selection for its after-dinner cheese platters. Its dishes are cooked to the right texture and are brought out in a timely fashion, allowing you to enjoy each plate that arrives as you enjoy your dining partner and surroundings. And now, the discussion on plates. Many restaurants capitalizing on the tapas trend have veered away from the traditional view of tapas, which are almost like finger food served at Spanish bars and often served as the cook’s experiment with what he has in the kitchen. Restaurants in the United States have catered small dishes to the tastes of the American diner, coming up with small plate menus that are basically a regular menu but on smaller plates. 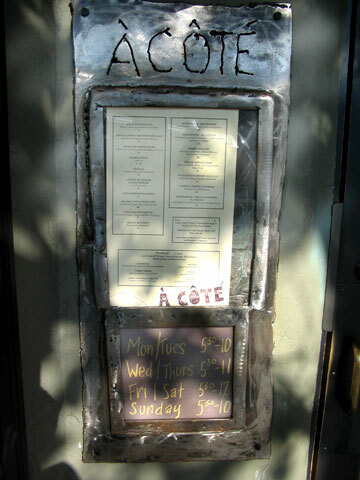 A Cote falls into that trap with its offerings of salads, soups, and heavy entrees like duck and pork. But it does price the dishes well, unlike other restaurants that have charged entree prices for their small dishes. A minor note: Skip the after-dinner tea. While offering a variety, the tea comes from Mighty Leaf, a San Francisco tea retailer that I’ve always found to be unsophisticated and mundane. 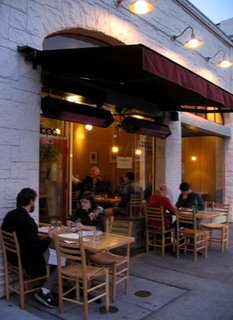 A Cote doesn’t necessarily shine to attract new people to Rockridge, but its steady menu and surroundings will keep the regulars coming. And with all those small plates, its dish washer will be busy for awhile. Marinate pork strips with white pepper, sesame oil, soy sauce, fish sauce and ginger. Set aside for 10 minutes. Heat wok or large skillet with oil. Over medium heat, toss in shallots and cook until translucent (about 1 to 2 minutes). Turn up the heat and add pork. Stir-fry for about 2 minutes, making sure to cook both sides to a nice brown color. Add peaches and sugar snap peas and cook for another minute. 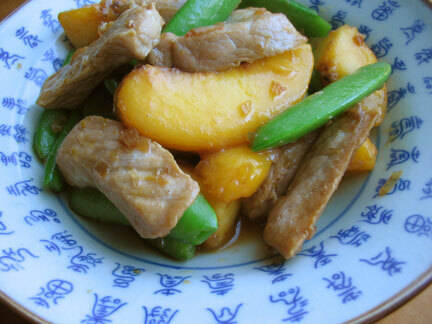 Finish by mixing in oyster sauce and remove from heat. Makes 2-3 servings. Serve with rice. Pair with crisp white wine like a Riesling or Gewurtztraminer. TIPS: When putting in the pork to the wok, don’t pour in all the marinade with it. Too much liquid will make your stir-fry more of a soup. You want your wok to sizzle with some liquid so your meat doesn’t burn, but not drowning in marinade. Keep leftover marinade on the side and add a little at a time, if needed, to prevent your ingredients from burning. BLANCHING: Prepare your peach before you start cooking by bringing a small pot of water to a boil. Drop in your peach for about 30 to 60 seconds and then take it out, immediately dropping it into a cold bath (another small bowl with cold water and ice cubes). Leave in for about a minute and then take it out. Now you can easily peel off the skin and start cutting your peach into pieces.